Free Shipping Included! Save 1% on the Home Master HMF3SDGFEC Whole House 3-Stage Water Filter with Fine Sediment, Iron, and Carbon by Home Master at Shop For Less. MPN: HMF3SdgFeC. Hurry! Limited time offer. Offer valid only while supplies last. Great for well water with Iron, Manganese, and Sulfur problems up to 3 ppm combined contaminant load. Have your well water analysis before buying. Great for well water with Iron, Manganese, and Sulfur problems up to 3 ppm combined contaminant load. Have your well water analysis before buying. Fully Assembled Home Master 3-stage whole house filter treats: sediment, turbidity, iron, manganese, sulfur smell, pesticides, herbicides, and other chemicals. The main purpose of the Home Master whole house water filter is to deliver clean, clear water to every faucet and bath in your home without drawing down water pressure. The Home Master Filter Pressure Performance Series was designed with your comfort and convenience in mind. Its uses oversized filters, housings, and fittings whenever possible to ensure your water pressure never falls short. Larger housings mean larger filters, which require less frequent service, which in turn saves you time, money, and inconvenience 1st Stage Filter, multi gradient depth polypropylene sediment filter. 25 micron surface, 10 micron layer, 5 micron layer, 1 micron inner core, designed for purity with bacterial and chemical resistance, four separate filter layers for enhanced filter performance, triple the dirt holding capacity of similar sized cartridges, typical life cycle 6, 12 months depending on usage and sediment quantity. 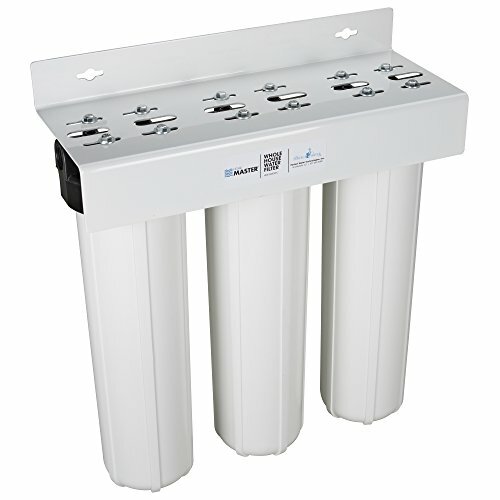 2nd Stage Filter - Radial Flow Iron, Manganese and Sulfur Reduction Filter, Radial Flow design provides excellent iron reduction with minimal pressure drop (<1 psi pressure drop), Easily and effectively reduces Iron, Manganese and Sulfur in water up to 3ppm combined, Reduces possibility of pipe and water heater damage, Lifecycle based upon iron quantity. 3rd Stage Filter, Radial flow granular activated coconut shell carbon , chlorine, chemicals, taste, and odor removal -100,000-Gallon, Improved carbon contact time for purer water, Highest grade coconut shell carbon for maximum chemical contaminant removal. In the box: Fully assembled Home Master Filter system with filters, steel mounting bracket with bolts, housing wrench, instructions.